I remember that someone once asked me how do I manage to dress stylish and what inspires me. The answer was so simple that at first I couldn't believe it myself - TV. Movies and TV shows, to be precise. There are so many colorful and inspirational characters created that it would be a shame not to share my idols. So, I decided to do a series of posts including my favorite fictional characters, whose personalities and styles I adore. I chose to start with one of my not so long ago seen movies Ginger&Rosa. Oh, and I'm going to write these posts just in english. I'm not sure why, though. Everything happens in 1962. 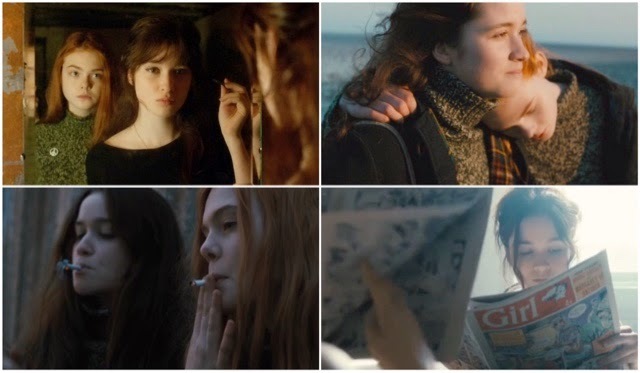 As the title would suggest, two friends Ginger and Rosa are in the center of the movie. Best friends since birth who do crazy things until *SPOIL ALERT* Rosa starts falling in love with Ginger's dad. She believes in eternal love, hearts and butterflies, while Ginger is trying to cope with her family falling apart. She's the real hero here, who not only reads poetry but also participates in demonstrations against the Cuba crisis and the danger of a nuclear war. So that's a bit of information about the plot, but now I would like to focus on clothing. I never liked turtle-necks but Ginger and Rosa just seem to rock them very well and now I have found myself wanting an oversized, slouchy roll-neck as well. It's strange, how movies make you to want things you have despised all your life, isn't it? 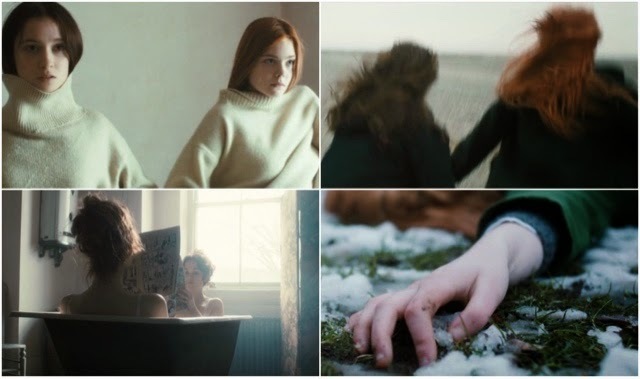 The not so popular green/khaki color is also one of the main clothing accents in the movie, especially on coats and sweaters. Of course, there are also some classic pieces like jeans, blue shirts, knee-high socks and satchels. Gotta love the 60's. Although the point of these kinds of posts will be to focus on clothes, fashion and style, this blog is about beauty, so I can't leave the makeup alone. In this movie everything is about a natural makeup look - pale and flawless skin, naturally full brows, untouched eyes and lips. The only noticeable addition to makeup is winged liner. No mascara, though. And although the 60's were all about the flower kids and freedom, cat eyes were something that didn't die together with the 50's Dior classic and elegance. A very modest yet interesting look, I should say. Oh God, but seriously, the record players, the hair straightening technique by using an iron, the first smoke of a cigarette... 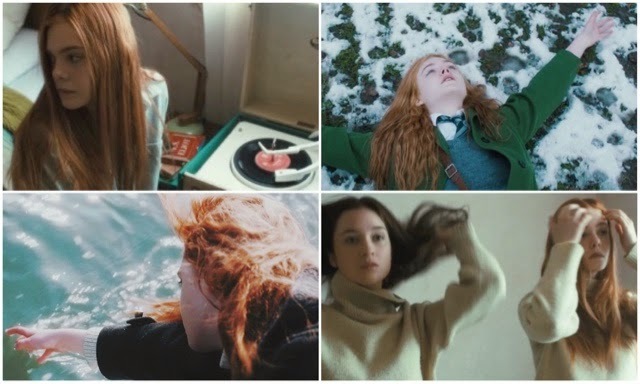 This movie just makes me want to dye my hair red and to do bizarre things. Run by the seaside. Read magazines in a bathtub. Wear same clothes as my friend. Lie on the ground and watch clouds passing by. 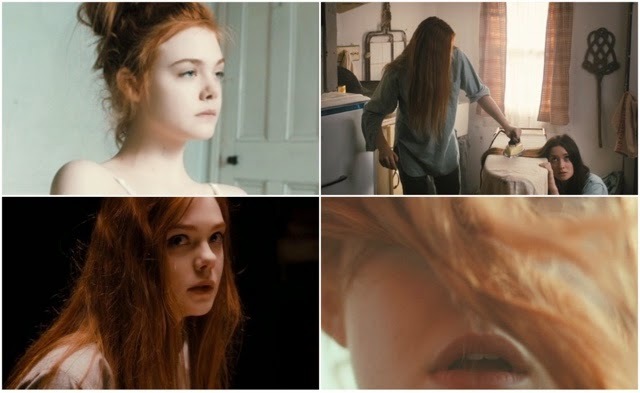 Elle Fanning's characters never fail me and she has done a marvelous job once again. I think I'll be off to search for my knee-high socks now.